One class at Le Mans came down to an absolutely nail-biting finish: LM GTE Pro. No. 63 Corvette Racing driver Jordan Taylor was playing a successful game of keep-away from the No. 97 Aston Martin of Jonathan Adam—only, Taylor threw that lead away when he short-cut a chicane and damaged the Corvette. Adam gave Corvette die-hards a scare in the final moments of the race when he locked it up and ran wide to try and pass Taylor, however, that didn’t stick for long as Taylor got right up in Adam’s fenders to retake the lead. 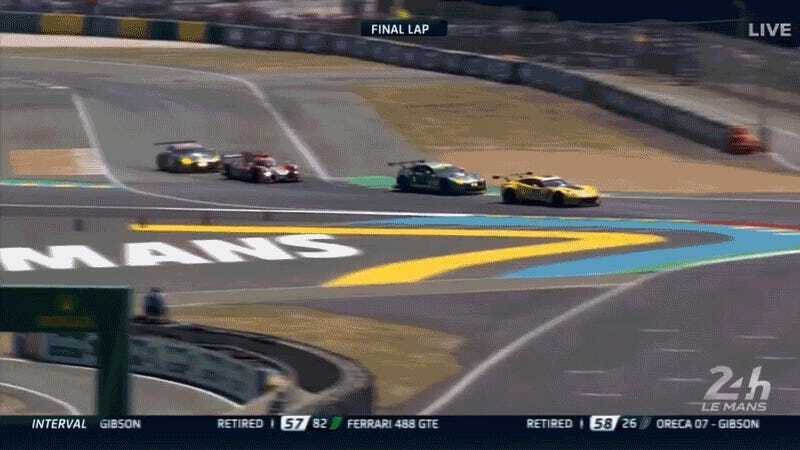 Taylor then tried to put some distance on Adam, but Adam eventually pressured Taylor into running across one of the Mulsanne chicanes, running the low-slung Corvette C7.R through gravel which damaged the front of the car. Taylor’s wounded Corvette at the end of the race. Screencap via WEC. Taylor was able to keep Adam behind him until the start/finish straight, where Adam passed him for the lead at the start of the very final lap. The Corvette was showing its wounds now, slowing dramatically with a front-right puncture. Taylor’s car had no front grip and was starting to disintegrate around the busted tire, letting the No. 67 Ford GT of Harry Tincknell through on the last lap. The No. 91 brand-new mid-engine Porsche 911 RSR nearly made it onto the podium, only it stopped to swap tires with 15 minutes to go, losing about 16-17 additional seconds in the pits that was just enough to let the No. 67 Ford through. The No. 91 911 RSR then finished fourth. 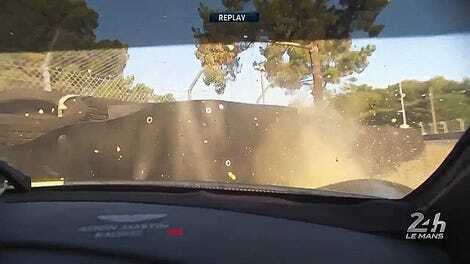 LM GTE Am had a much more cut-and-dry finish in comparison. The winning No. 84 Ferrari 488 GTE of JMW Motorsport was a full two laps ahead of the next car at the end of the race. All three podium winners in LM GTE Am were Ferrari 488s, with the No. 55 Spirit of Race Ferrari claiming second place and the No. 62 Scuderia Corsa Ferrari in third.